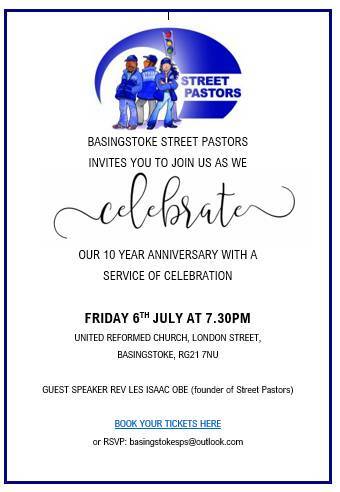 This year (2018) Basingstoke Street Pastors celebrates its 10th year working in the town. The first team went out on patrol on Friday, 25th July 2008. We are holding a Service of Celebration on Friday, 6 July at 7.30pm, at the United Reformed Church, London Street, Basingstoke, RG21 7NU. Rev Les Isaac OBE, the found of Street Pastors in the UK, is our guest speaker. The Police and Crime Commissioner Michael Lane, Chief Inspector Matt Reeves – District Commander of Basingstoke and Deane Police, Maria Miller MP, the Bishop of Basingstoke -the Reverend Canon David Williams, and the Deputy Mayor Cllr Diane Taylor will all be there to mark this special occasion. We would like to invite each and every one of you to this service. Please help us make this a big event for Basingstoke by inviting your family, friends and church family. Please feel free to share the link on social media, etc. or email basingstokesps@outlook.com or phone 07749 193 927.